This coin salutes the mission of the Air Education and Training Command to foster the growth and development of the world's most advanced aviation force. The obverse contains the emblem of the Air Education and Training Command. The reverse bears the official symbol of the U.S. Air Force. Minted in a brass alloy, this coin is imbued with colorful enamel on both sides. 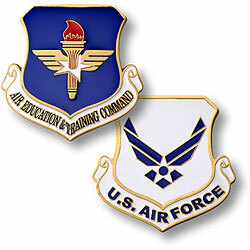 Each coin comes packaged with a detailed header card that describes the history of the Air Education and Training Command.